Hi bloggers! Hope you're all doing well! 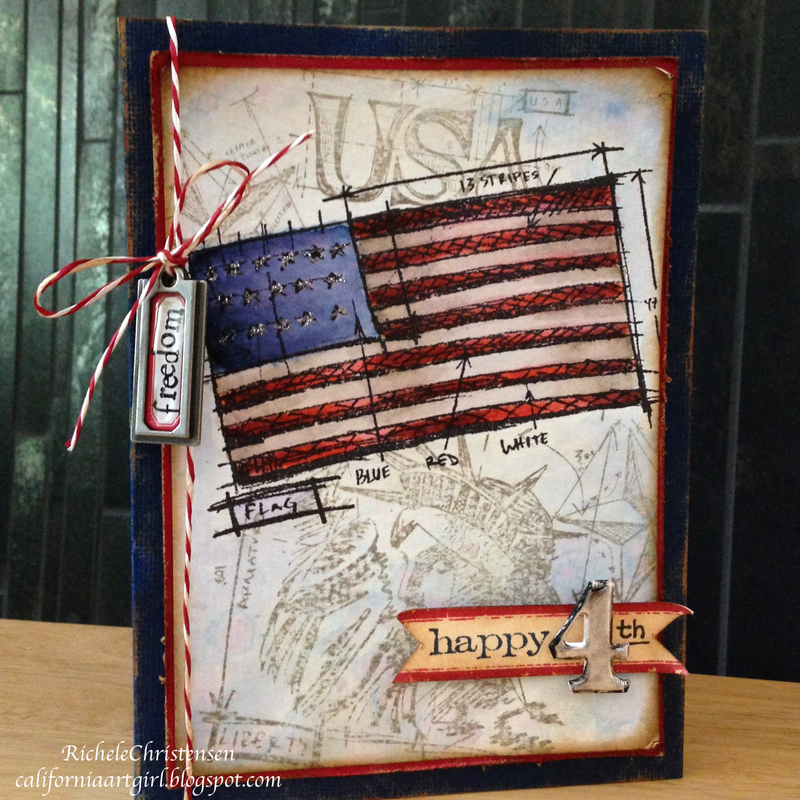 With the 4th of July right around the corner seems appropriate to share a card to gear up for the holiday. 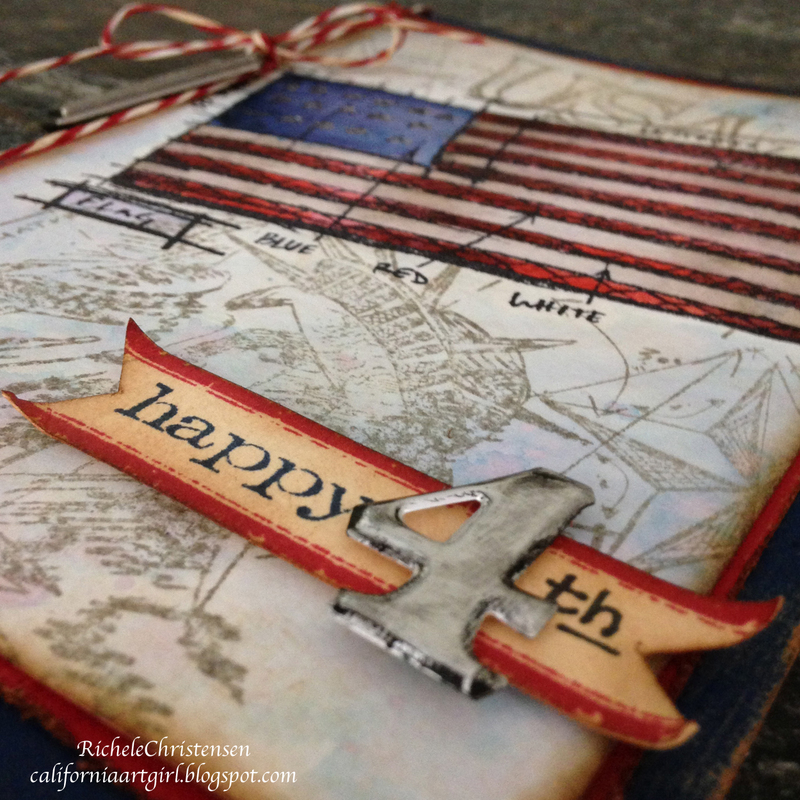 Do you have plans for a big celebration, maybe a BBQ or possibly some fire works? 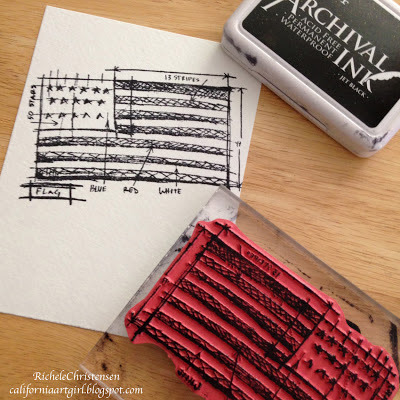 Stamp the image onto a piece of watercolor paper with jet black Archival ink. 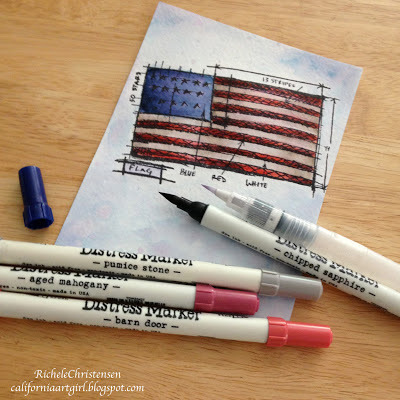 I like using water color paper when coloring with Distress Markers. The inks react so beautifully. You can color directly on the paper and once you add water with the water brush you don't see any lines from coloring. Makes you look like a pro water color artist! Color the flag and background with Distress Markers and a detail water brush. I made the outer part of the strips darker as well as the center. 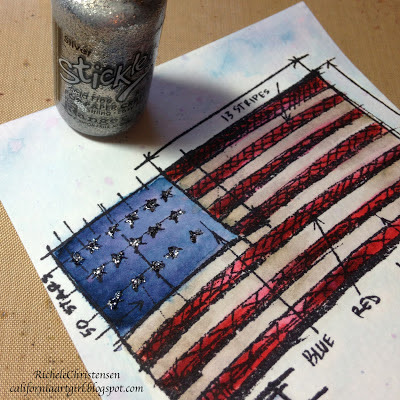 Adding silver Stickles to the stars adds a little sparkle. 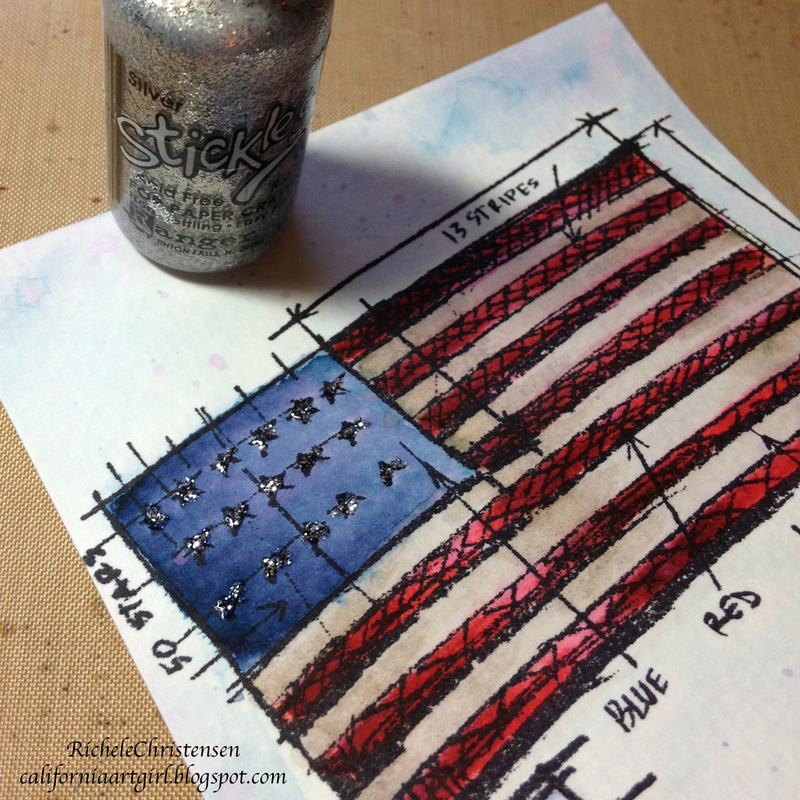 I masked off my flag and added some background stamping using Pumice Stone Distress ink. I love what it adds to the background. 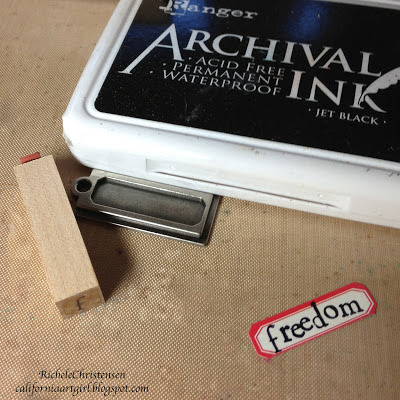 Stamp the word "freedom" onto a tag label with jet black Archival ink. Add to the tag! These little tags even have a clear bubble that goes on top. Cut your blue base card from Kraft'core, score and fold in half. Sand and ink the edges. Do the same for the red matte. 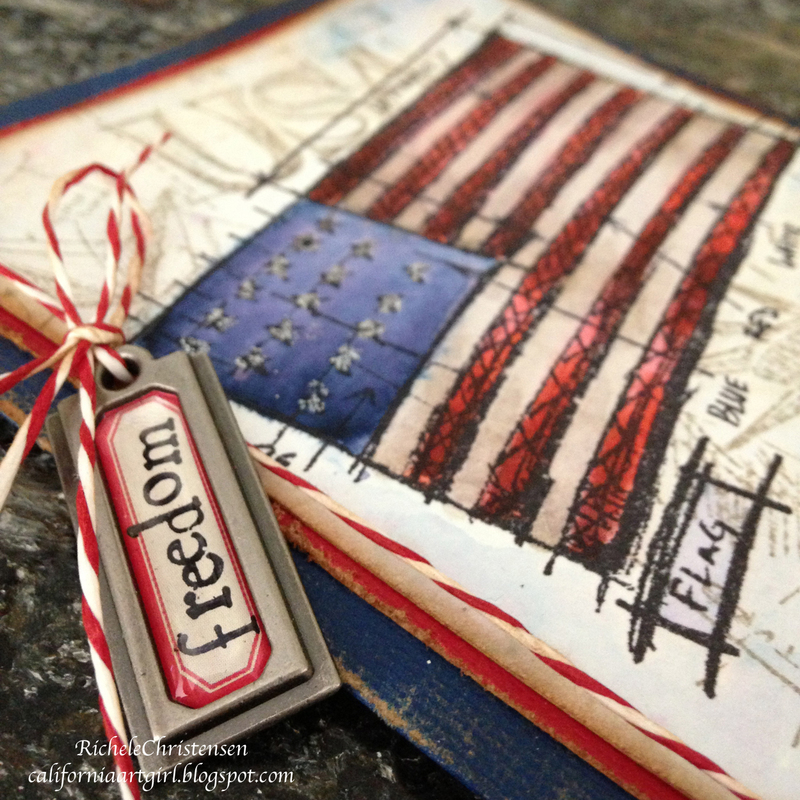 Tie red striped paper string with a bow and don't forget to add the freedom tag label. 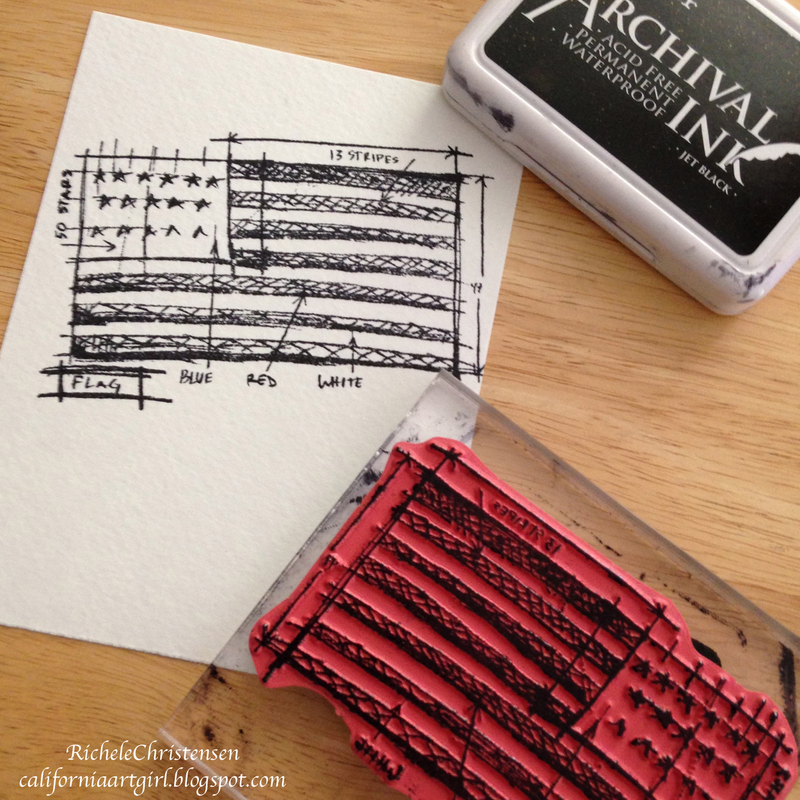 Stamp the border with Vermilion Archival ink on manilla card stock. 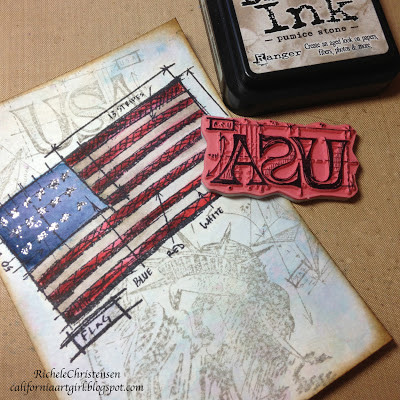 Ink the happy only from the happy birthday stamp with cobalt Archival ink from Tim's Simple Sayings Collection stamps and stamp within the border to the left side. Trim the strip as shown. Rub black soot Distress paint on the mini numeral "4", buff off excess and adhere to card. Also add a "th" for the 4th with a black pen. For more inspiration, Paula Cheney has an amazing card using the same set. Also see Tim Holtz has been posting fun projects all week! 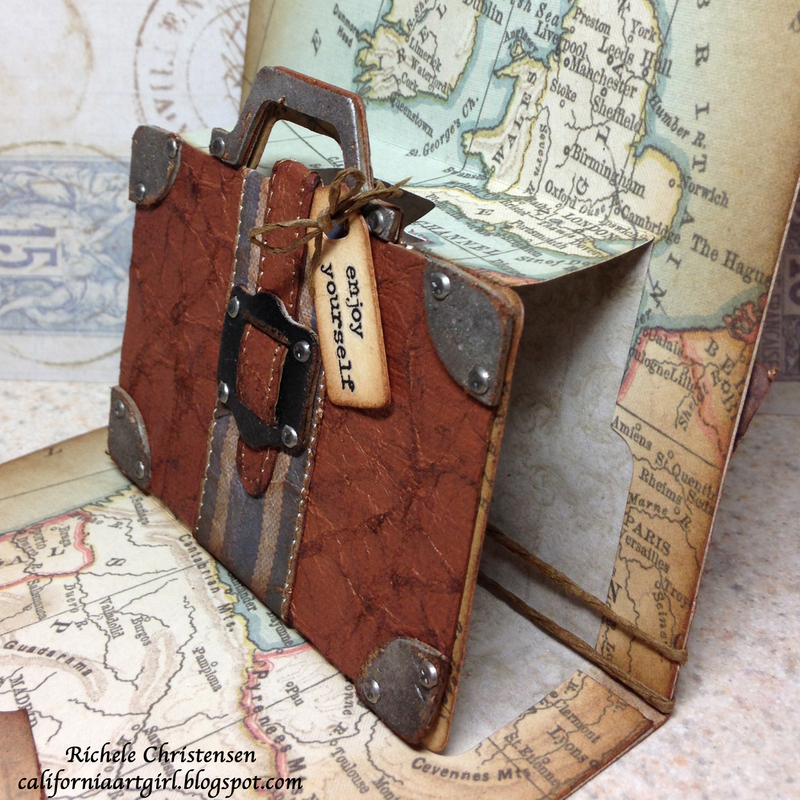 If you need some crafting supplies, Inspiration Emporium has it all! Hi bloggers! You are going to LOVE this card. I'm using the NEW Pop 'n Cuts Suit Case Insert with the base die from Karen Burniston's Journey collection. I think this is her BEST release yet. Thanks Karen! 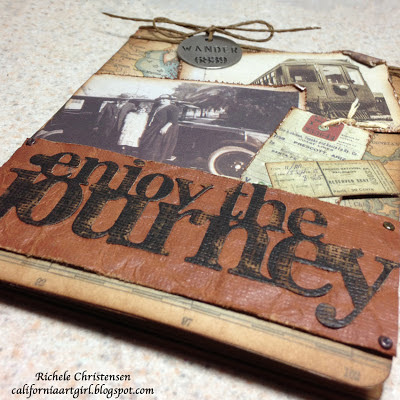 Don't forget to check out Karen's blog for tons of inspiration! 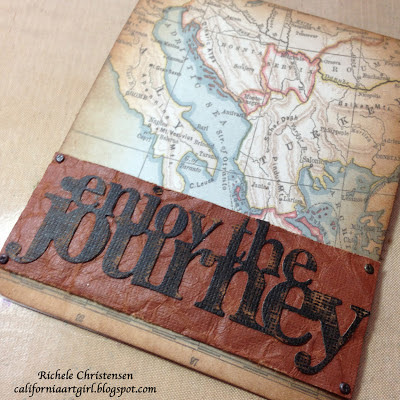 I started thinking that a suit case usually involves a journey, so I thought the message "Enjoy the Journey" was a perfect match. Here's a peek at the inside, I love the little Suit Case! It looks just like a vintage leather bag. I learned this faux leather technique when I went to Ranger U so many years ago. 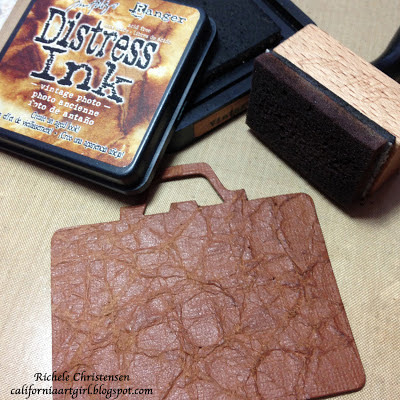 It's so easy to transform your paper to look like leather. 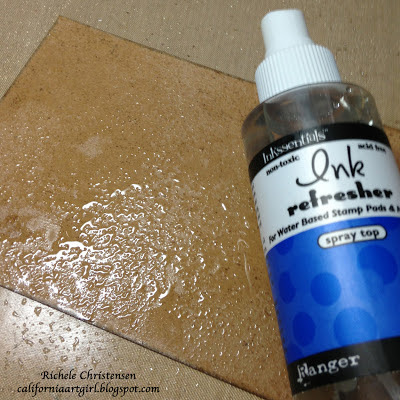 First generously spray the back side of the Kraft'Core paper with Inkssentials Ink Refresher. I chose a rust color that looks like leather. Massage the Ink Refresher into the paper. 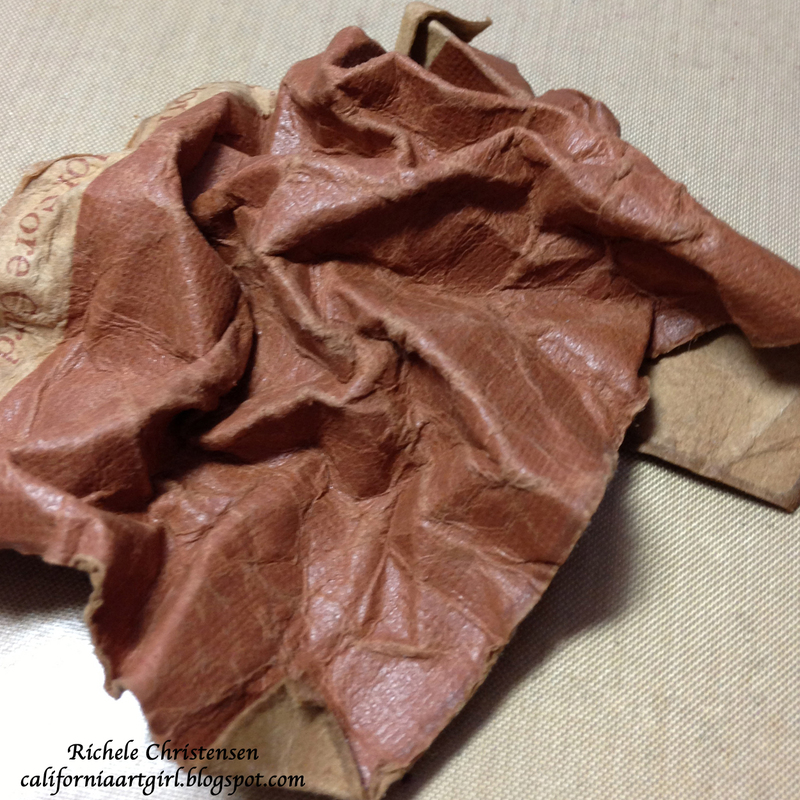 As it works into the grain of the paper, the paper will become softer and you will be able to crumple it up. 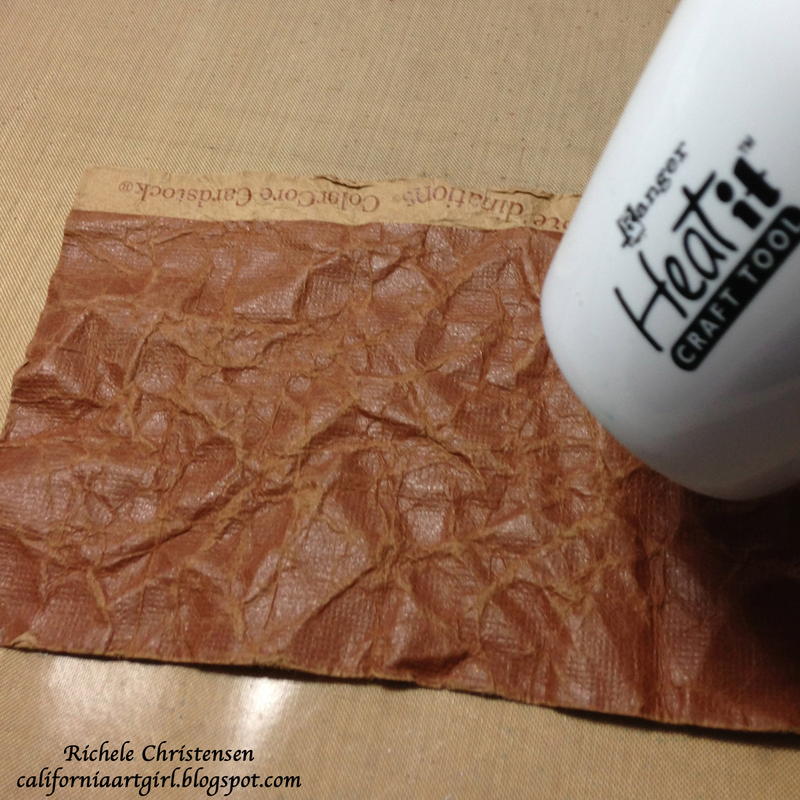 Flatten out the paper and dry with a Heat Tool. Because I want my Suit Case to be more sturdy I glued a kraft tag to the back side of my leathered paper with a Collage Glue Stick. 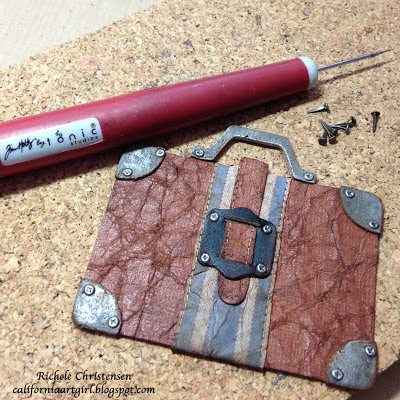 Die cut the Suit Case using the from the reinforced leather paper. Ink with Vintage Photo Distress Ink on an Ink Blending Tool. 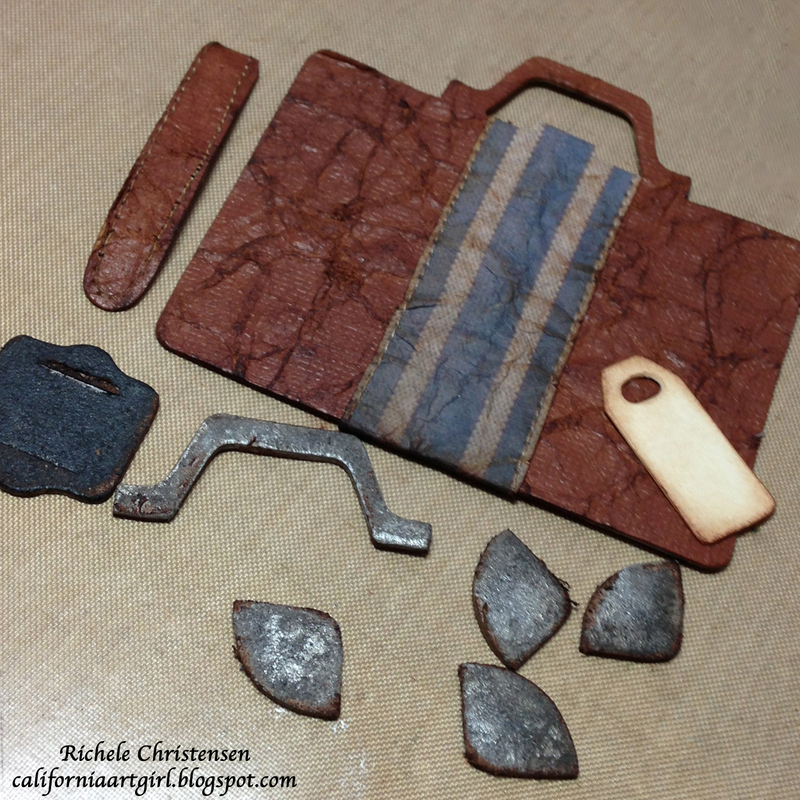 I also die cut all the little pieces from Grunge Board. I love all the little details that come on Karen's die. 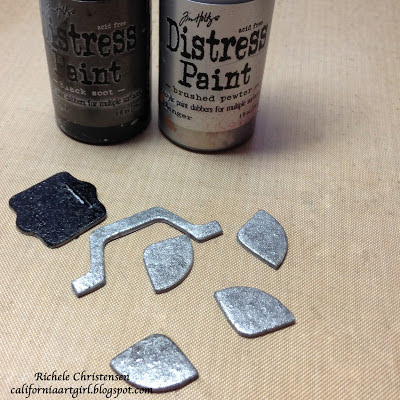 Paint the pieces with Brushed Pewter and Black Soot Distress Paint. 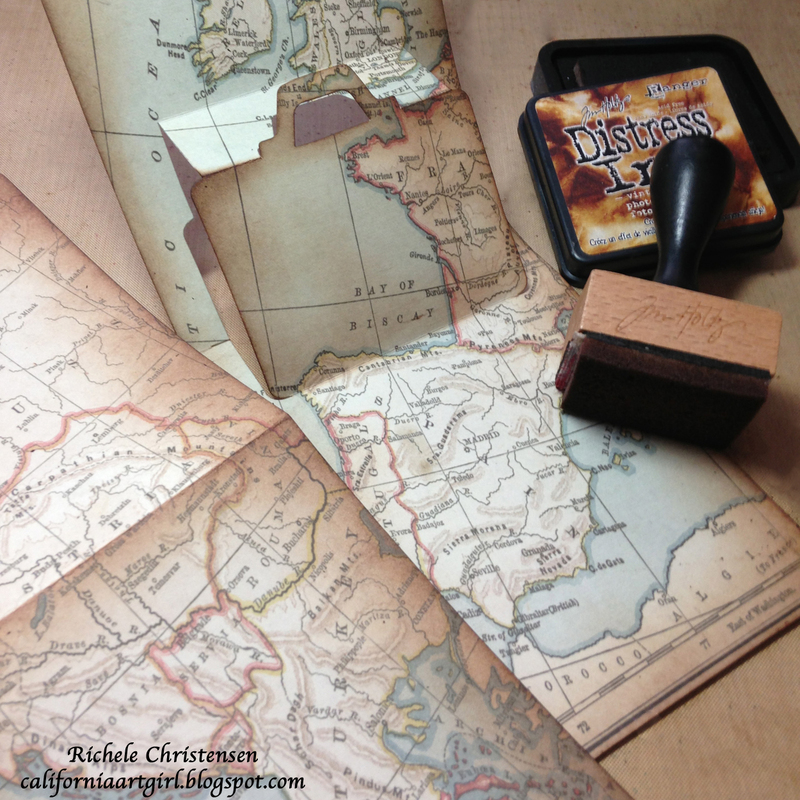 After the paint is dry sand and ink with Vintage Photo. I did a little stitching on my sewing machine to add a band down the center of the Suit Case and add detail to the strap. Sand and ink these pieces too. To attach the details to the Suit Case I added Mini Fasteners. 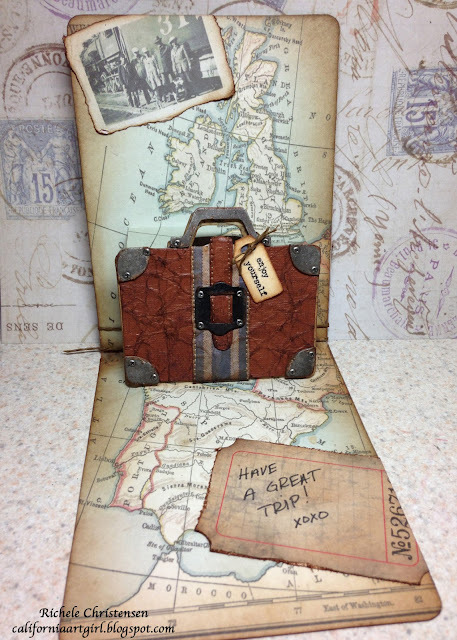 Die cut the inside and the outside of the card using Karen Burniston's Base die and the new Suit Case insert from the Journey collection. Die cut the phase "enjoy the journey"from black Kraft'Core. Before you punch it out, it's best to sand at this time, this will help the letters not to tear. 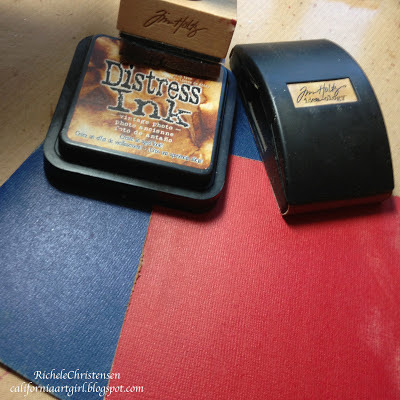 Ink with Vintage Photo Distress Ink. 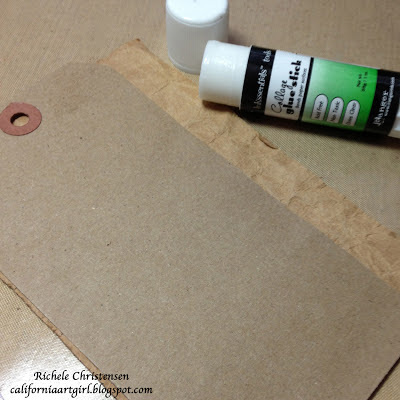 Add a strip of the leathered paper to the front of the card, don't forget the mini fasteners in the corners. Adhere your message. Now it's time to adhere the inside and the outside together. 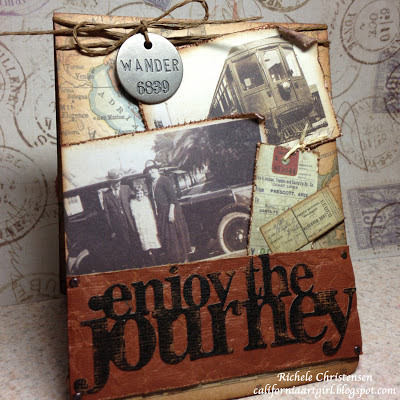 Add vintage travel photos and a few tickets to the front of your card. Tie the wander tag around the top of the card with paper twine. Adhere the Suit Case to the inside of the card. The message was added to the little tag with Remnant Rubs. Tie the tag to the handle with a bow using one ply of the paper twine. Just look at this little Suit Case. SUPER CUTE don't you think! Inspiration Emporium is a FUN place to shop!! Hi bloggers! I'm sharing a great guy card over on the Sizzix blog today! 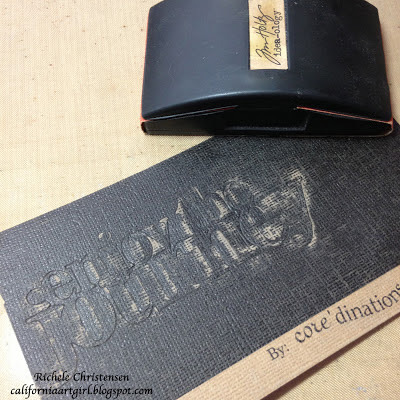 The card features Stamp2cut on the eclips, embossing with Texture fades and some inking techniques. I hope you'll check it out here. 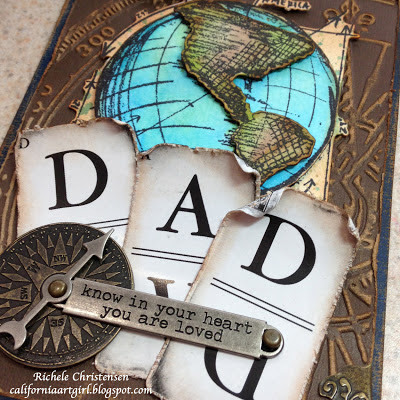 I hope you're planning on making that someone special a card for Father's Day! I know my Dad will appreciate my hand made card. I better get busy and make a card for my husband too! Thanks so much for your comments, I love to hear from you! 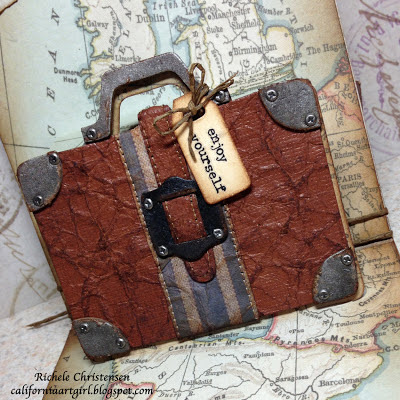 Here's a great place to find product! !